Beginners archery course delivered by qualified Archery GB coaches. Northern Archery coaches. We are 2 very dedicated Cumbria County Archers with over 20 years’ experience between us. Martin Leonard specialises in traditional Longbow archery and has many historic facts to pass on to the young people. Ian Robinson specialises in modern Compound Bow archery which has a big wow factor for the young people. Both Martin and Ian are qualified Archery GB coach’s levels 1 and 2, and both hold full enhanced DBS clearance and have child protection course certificates. Our specific archery insurance means all young people are fully insured. We can also carry out any risk assessments that may be required. At Northern Archery, we feel that there are some very good benefits to the young people whilst taking part in archery. It is a low impact sport for the younger ones, whilst still being physical and mentally challenging. It improves motivation, attention, behaviour and it is a good life skill. 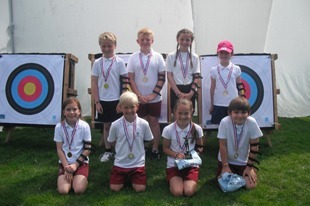 Archery can be introduced to primary and secondary schools and we can provide programmes for young people from 6 to 18. We can provide a teaching programme designed to suit your school’s needs, or deliver either our standard beginners course or skills development courses. These can be run as part of the curriculum or as an after-school club or as a one-off taster session. please complete the short form below & we will get back to you ASAP. I agree to Northern Archery collecting & storing information to process my enquiry.